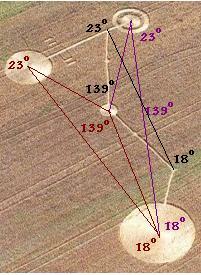 Crop circles called out of teens' league / Paranormal SWAT team won't rule out alien authorship. Teenagers claimed these crop circles, which appeared in a Solano County wheat field one Friday night in July, were their handiwork. Curiously, Nancy resided in the San Francisco area before coming to Wisconsin, and the California July circle (above) has similarities to the July 4 Wisconsin circle (right) containing the ZetaTalk triangle. Both are balanced on either side, like a mirror image. The Zeta description of the triangle does not specify if the point where Planet X pierces the Earth's ecliptic plane is to the right, left, above, or below where the Earth might be at that time. Starting on Sep 23, just after the Equinox, it was noted that the Earth was bobbling up in its ecliptic, placing its S Pole above the N Pole of the approaching Planet X in the manner magnets prefer. The Eastfield circle (below) implies that after a Solstice or Equinox, the orbit of Earth will radically change. A lift in the Ecliptic is implied by the line being pulled into the center, a halted or reversed orbit is implied toward the end of this 13 week period. It may be that rotation stoppage find the Earth above Planet X, above its Ecliptic plane, by that degree.